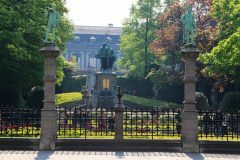 See statues of Count Egmont and the 48 Brussels trades in this small park across the road from the Notre Dame church in the Sablon neighborhood of Bruxelles. The Kleine Zavel (Place du Petit Sablon) is a small park across the road from the Notre Dame du Sablon church in one of the most fashionable districts of the Belgian capital. This small park is mostly famous for statues: counts Egmont and Hoorn who where decapitated by the Spanish in 1568, Dutch notables from the 16th century, and the 48 trades of Brussels. It is hardly a destination on its own but it is near the sights of the Mont des Arts area, as well as the popular weekends antiques market on Place du Grand Sablon on the opposite side of the Notre Dame church. 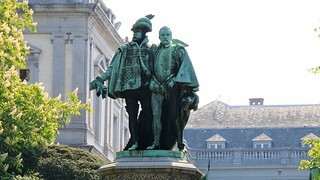 At the heart of the Kleine Zavel park (Place du Petit Sablon) in Brussels is a statue of Count Egmont and Count Hoorn. They were both key figures in the 16 th-century Dutch revolt against Spanish rule that resulted in the Eighty Years War and an independent Dutch Republic. The Dutch penchant for beeldenstorm (iconoclasm or literally storming of the statues) and Calvinism clashed strongly with the Spanish royal desire to maintain the Roman Catholic Church with all its ecclesiastic laws (and statues of the saints intact) in all its territories. The creation of new bishoprics and attempts to introduce the inquisition in Flanders, led to opposition to Spanish rule including protests from Counts Egmont, Hoorn and Orange, who were the most senior nobles in the Netherlands. In 1567, the notorious Duke of Alva arrived in Brussels as special envoy for Spanish King Philip II to restore order and Roman Catholicism in Flanders and the rest of the Low Countries. Orange, who had good spies in the Spanish court, warned Egmont and other nobles before fleeing from Flanders to his German properties. Egmont felt secure in the knowledge that he had not committed any treason and stayed in Brussels. Furthermore, Egmont, like Horne and Orange, were knights of the Order of the Golden Fleece and thus could not be judged by anyone other than the Spanish king in person. Alva soon had Egmont and Hoorn arrested and locked up. His mission showed uncommon zeal and efficiency: in less than five years, near 9,000 people were interrogated and found guilty of treason, or heresy, or both. More than a thousand were executed including many members of the Dutch nobility. The most famous were of Egmont and Hoorne. Alva ignored their insistence that only King Philip II could judge Members of the Golden Fleece. Similarly, he ignored all pleas (and demands) from nearly all Knights of the Golden Fleece and nearly all German princes – Egmont and Hoorne’s wives were both very well connected with senior German nobility. Both Egmont and Hoorn remained loyal to the Spanish crown and to the Roman Catholic faith right to the end. 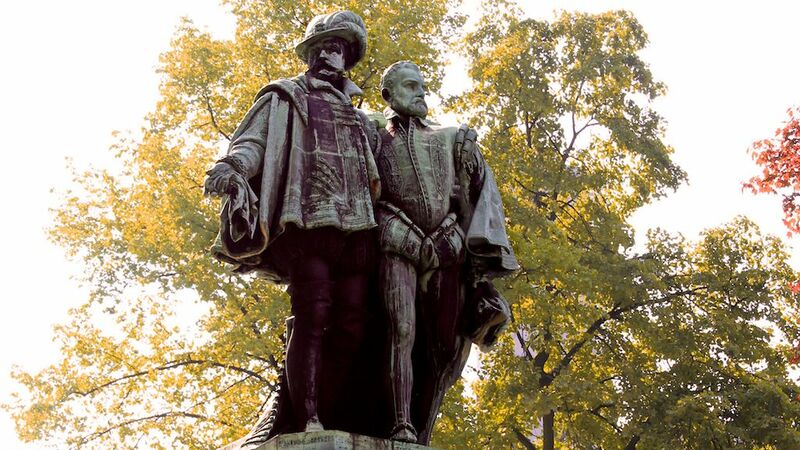 On 5 June 1568 they were both executed on the Grote Markt (Grand Place) in Brussels. Egmont maintained his dignity to the end while Hoorn cursed the Spanish on the scaffold. Shortly before his execution, Egmont managed to write a letter to the King of Spain proclaiming his innocence and continued loyalty. This letter is considered to have contributed largely to the restoration of most of his confiscated properties to his family. 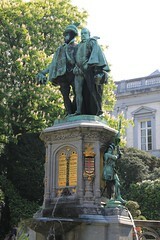 The statue of the Counts of Egmont and Hoorn in the Kleine Zavel Park was made by Charles Auguste Fraikin in 1864. Originally, it was installed on the site where the execution took place on Grote Markt (Grand Place) in front of the Broodhuys (Maison du Roi). However, it was already moved to the newly created Kleine Zavel Park that opened in 1890. Graaf Lamoraal Egmont is on the left with his hat on his head. His coat of arms is the more complex one. Graaf Filips Horne was from the Montmorency bloodline, as is clear from his coat of arms. Both coats of arms are surrounded by a golden chain showing that the counts were Knights of the Golden Fleece. At the base of the statue are two soldiers dressed in the uniforms worn at the battles of Grevelingen and Saint Quentin where the counts fought valiantly with Spain against the French. Egmont commanded the Spanish troops at Gevelingen, where his horse was famously shot dead from under him. Johann Wolfgang von Goethe can take much of the credit that Egmont is today still well known in the wider world and not a mere footnote in the history of the Dutch struggle for independence from Spanish suzerainty. Goethe’s tragedy Egmont was completed in 1788, although much of it was written earlier in his Sturm und Drang period. The play retells the story of Egmont and the downfall of an honest man who foolishly relied on his own self-belief of righteousness, honesty and his erroneous trust that others will also see him as such. (Available for free at Project Gutenberg in English and German.) Ludwig van Beethoven wrote incidental music to the play – the Egmont Overture Opus 84 is still frequently played. William the Silent (Willem de Zwijger / Guillaume le Taciturne), or the Prince of Orange (Oranje), is of course the most famous of the trio who opposed the introduction of the inquisition in Flanders. Having had the foresight to flee to his German estates, he escaped the executioner’s sword and led the Dutch revolt against the Spanish suppression at the beginning of the Eighty Years War. In The Netherlands, Willem van Oranje is still considered the father of the nation and the Dutch national anthem is largely a hymn in his honor. William was assassinated in Delft in 1584 by an agent of the Spanish Roman Catholics, long before the Dutch Republic was finally acknowledge by all European powers as part of the Peace of Westphalia in 1648. In the Kleine Zavel Park, Willem (Guillaume le Taciturne) plays a subservient role to Egmont and Hoorn. His statue is one of a group of 10 statues of leading Dutch figures from the 16th century. They all contributed vastly to the development of the Netherlands but few will be known to non-local visitors. The rest of the park is a pleasant mix of flowerbeds, paved paths, tall trees and several benches. 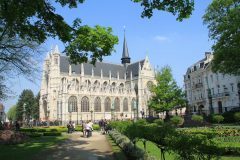 From here, visitors can enjoy lovely views of the Flamboyant Gothic Notre Dame du Sablon church. Particularly noteworthy in this church are the two 16th-century chapels for the Turn and Taxis family, who had a monopoly on the postal system in much of Europe. The exit of the Kleine Zavel at the rear behind the statues is at a higher level and near the much larger Egmont park. The Palais d’Egmont, or Palais d’Arenberg, was formerly the Brussels residence of the Egmont family but now used for high-level receptions. The last major attraction of the Kleine Zavel park is the fence – each statue, pillar and section of wrought ironwork is unique. The 48 life-sized statues on pillars attract the most attention. 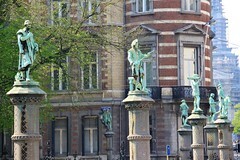 These 48 statues represent the traditional trades and guilds of Brussels. They were all designed by Xavier Mellery but he was a painter so the actual statues were produced by different artists. The various guilds and trades can be identified by their typical instruments or symbols. For example, the roofers with a ladder, millers with a millstone, and plumbers with a piece of pipe. The first statue at the entrance nearest to the Notre Dame is of the four crowned trades (ambacht van de Vier Gekroonden), which combined in a single guild the bricklayers, stone masons, paviours and tillers. They maintained a monopoly on building for centuries. A full list of the trades is available at Wikipedia (in Dutch and French only). The Kleine Zavel Park (Place du Petit Sablon) is hardly a destination on its own but it is very much worth seeing when in the vicinity. The entrance is right across the road from the Flamboyant Gothic Notre Dame du Sablon Church a short walk from the museums and royal sights at the Mont des Arts area of Brussels.